Scorn Brings a New Look and Attitude to Kingdom Come 2134! Scorn feels she is A WOMAN SCORNED. And that’s a big warning to the rest of the GWF female stars! 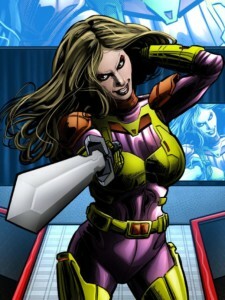 Scorn joined forces with Martial Law in 2133 and turned against her former partner, Elina. It’s about to get a lot worse in 2134! But will Scorn challenge the highly controversial new female wrestler that is coming in 2134? That’s the big question! Get psyched! KINGDOM COME 2134 is coming on July 14 in Pittsburgh and the rest of the galaxy shortly after! Pre-orders are coming soon, so pay attention! THIS IS THE BIG ONE! ← The Kiwi Buzzsaw Crashes the Best of UK Set!